“The first thing to realize about the ether is its absolute continuity. A deep sea fish has probably no means of apprehending the existence of water; it is too uniformly immersed in it: and that is our condition in regard to the ether.” – Sir Oliver Lodge, Ether and Reality. Nikola Tesla used ancient Sanskrit terminology in his descriptions of natural phenomena. As early as 1891 Tesla described the universe as a kinetic system filled with energy which could be harnessed at any location. His concepts during the following years were greatly influenced by the teachings of Swami Vivekananda. Swami Vivekananda was the first of a succession of eastern yogi’s who brought Vedic philosophy and religion to the west. After meeting the Swami and after continued study of the Eastern view of the mechanisms driving the material world, Tesla began using the Sanskrit words Akasha, Prana, and the concept of a luminiferous ether to describe the source, existence and construction of matter. This paper will trace the development of Tesla’s understanding of Vedic Science, his correspondence with Lord Kelvin concerning these matters, and the relation between Tesla and Walter Russell and other turn of the century scientists concerning advanced understanding of physics. Finally, after being obscured for many years, the author will give a description of what he believes is the the pre-requisite for the free energy systems envisioned by Tesla . This description of the physical mechanisms of the universe was given before Tesla became familiar with the Vedic science of the eastern Nations of India, Tibet, and Nepal. This science was first popualized in the United States and the west during the three year visit of Swami Vivekananda. “There manifests itself in the fully developed being , Man, a desire mysterious, inscrutable and irresistible: to imitate nature, to create, to work himself the wonders he perceives…. Long ago he recognized that all perceptible matter comes from a primary substance, or tenuity beyond conception, filling all space, the Akasha or luminiferous ether, which is acted upon by the life giving Prana or creative force, calling into existence, in never ending cycles all things and phenomena. The primary substance, thrown into infinitesimal whirls of prodigious velocity, becomes gross matter; the force subsiding, the motion ceases and matter disappears, reverting to the primary substance.” According to Leland Anderson the article was written May 13th, 1907. Anderson also suggested that it was through association with Swami Vivekananda that Tesla may have come into contact with Sanskrit terminology and that John Dobson of the San Francisco Sidewalk Astronomers Association had researched that association. Tesla understood the Sanskrit terminology and philosophy and found that it was a good means to describe the physical mechanisms of the universe as seen through his eyes. It would behoove those who would attempt to understand the science behind the inventions of Nikola Tesla to study Sanskrit and Vedic philosophy. Tesla apparently failed to show the identity of energy and matter. If he had, certainly Swami Vivekananda would have recorded that occasion. The mathematical proof of the principle did come until about ten years later when Albert Einstein published his paper on relativity. What had been known in the East for the last 5,000 years was then known to the West. Brahman is defined as the one self existent impersonal spirit; the Divine Essence, from which all things emanate, by which they are sustained, and to which they return. Notice that this is very similar to the concept of the Great Spirit as understood by Native American cultures. Ishvara is the Supreme Ruler; the highest possible conception of the Absolute, which is beyond all thought. Mahat means literally the Great One, and is also interpreted as meaning universal mind or cosmic intelligence. Prana means energy (usually translated as life force) and Akasha means matter (usually translated as ether). Dobson points out that the more common translations for Akasha and Prana are not quite correct, but that Tesla did understand their true meanings. Tesla continued to study Hindu and Vedic philosophy for a number of years as indicated by the following letter written to him by Lord Kelvin. I do not know how I can ever thank you enough for the most kind letter of May, 10, which I found in my cabin in the Lucania, with the beautiful books which you most kindly sent me along with it: -“The Buried Temple”, “The Gospel of Bhudda”, Les Grands Inities”, the exquisite edition of Rossetti’s “House of Life”, and last but not least the Century Magazine for June, 1900 with the splendid and marvelous photographs on pp. 176, 187, 190, 191, 192, full of electrical lessons. We had a most beautiful passage across the Atlantic, much the finest I have ever had. I was trying hard nearly all the way, but quite unsuccessfully, to find something definite as to the functions of ether in respect to plain, old fashioned magnetism. A propos of this, I have instructed the publishers, Messrs. Macmillan, to send you at the Waldorf a copy of my book (Collection of Separate Papers) on Electrostatics and Magnetism. I shall be glad if you will accept it from me as a very small mark of my gratitude to you for your kindness. You may possibly find something interesting in the articles on Atmospheric Electricity which it contains. Walter Russell was one of the most accomplished artists, sculptors, writers and scientists of this century. His periodic chart of the elements accurately predicted the location and characteristics of four elements years before they were discovered in laboratories. These are now known as Deuterium, Tritium, Neptunium, and Plutonium. Russell apparently entered into a heightened state of awareness after being struck by lightning. He began several weeks of drawing and writing about the basic nature and make up of the physical universe. Russells’ family finally called the family doctor to determine if Russell should be committed to an mental institution. The doctor, upon seeing the results of Russells weeks of work, said that he did not know what Russell was doing, but that he definitely was not mad. Why free Energy hasn’t Happened Yet, Comments, Possibilities and Socio Economic Implications. Although Tesla did not accept many of the tenants of relativity and quantum theory and never made the connection between matter and energy, he did recognize the possibility of free and unlimited energy as demonstrated by the following statement. We see that Tesla is asking a question, speculating, searching for an answer. If Tesla had developed free energy sources or learned how to manipulate space time and gravity, during the time of his most public and productive years, (up until about 1920), he would have had answers to those questions. 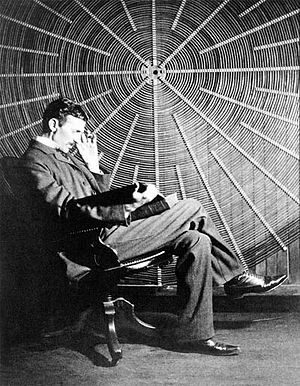 So we see that mankind has not yet harnessed the infinite power of the universe as envisioned by Nikola Tesla. The question remains, why not? Free energy devices, if they are feasible, are not about smaller faster microcircuits or a bigger better mouse traps. This is a technology which may revolutionize the socio-economic status quo on planet Earth. At this moment the big pie is unevenly divided. One quarter of the population on this rock, the third stone from the sun, consumes three quarters of the yearly resource output. As one can easily deduce, from a brief study of world affairs, there are about three billion people who have just about had it with this scenario. There are wars starvation and strife in every nook and cranny of the planet. So what do we do about it? Either we divide the pie more evenly or we make the pie larger. The first option requires that our standard of living must fall so that the standard of living in the third world may rise. The second option allows us to maintain our standard of living while we help raise the standard of living of under privileged nations. This we must do. It is our destiny. It is our responsibility. It is our final test. Thirty thousand people starve to death every day on this planet, most of them are children. Nations fight nations, war is part of our lives. What drives our economy in the western world, allows us to enjoy a high standard of living, a life of leisure compared to our neighbors south of the imaginary line called a border? Many answers both economic, social, political, and spiritual can be given. We do know that the standard of living that a nation enjoys is directly related energy consumption. Energy drives the economies of nations and Tesla’s life long goal was to make electric power equally available to all people any where on this planet. He continued to promote his plan for the wireless transmission of power in the yearly interviews he gave on his birthday as late as 1940. 19 Electrical power allows on site processing of raw materials. Electrical power can run pumps from water wells in areas affected by drought. Electrical power delivered to the poverty stricken areas of the world can make the pie larger, can help bring about the needed economic equality which is our birth right. Why hasn’t power been made equally available to all people and nations? Why haven’t the much touted free energy devices described by Tom Bearden, John Bedini, Bruce DePalma, and others ever materialized? Perhaps because “easy things are seldom done for the same reason that impossible things are rarely done: no one will pay for anything believed to be easy or impossible”. 20 Perhaps because when we talk about power there is more there than one would initially visualize. What we are talking about is personal power, national power, planetary power, karmic power and the power of love. The sages tell us that in order to enjoy power we have to let go of power, to overcome ourselves. As an example this author can describe one of his recent experiences. After a very successful symposium celebrating the 100th year after Nikola Tesla arrived in the United States 21, a non profit corporation, 501(c)(3), was formed specifically to encourage and pursue research into the inventions and discoveries of Nikola Tesla. Two years later, after a second symposium, several of the founding members approached the board of directors with a proposal to validate Tesla’s claim that wireless transmission of power was possible. Board members suggested that permission be obtained from the FCC, an environmental impact statement be filed with the EPA, and we should go form “our own non profit corporation”. 22 It was also decided that since there was no procedure to cover research, the organization could not be involved. The board moved to table our proposal indefinitely. What had happened? Of the 15 – 20 people that had started the organization only four remained as part of the governing body. Three of those members were opposed to research. The collective mind of the board of directors had become the antithesis of the momentum Tesla had gained in his lifetime. Unlike the independent inventor and businessman, the board was now composed of members who were bureaucrats and paper pushers for Fortune 500 companies. Tesla was a vegetarian, the board members all ate meat. Tesla did not ask for permission to be inventive and strike out on bold new adventures, the board needed approval from higher sources. The dichotomies were endless. “When everything is perfect, the right time shows up.” 26 This is equivalent to saying, “Absolute knowledge in the hands of one whose heart is not yet tender, would be a terrible weapon. 27 We might postulate that technological developments do not occur until the planet is ready. The recent examination of the theory of Gaia credits the Earth with an intelligence. “Thousands of years ago, by means of seeing, sorcerers became aware that the Earth was sentinent and that its awareness could affect the awareness of humans.” 28 By implication of reciprocity the reverse could be true. The group or collective unconscious is still struggling with the result of quantum and relativity theory. We as a race were ready for nuclear power, every thing was perfect and the right time showed up. Soon we will have put the technology to good use or abandon it to insure our survival as a species. So what do you do about it – Free Energy: Creating an Idea whose time has come. Nikola Tesla describing what is now known as Schumann Resonance (7.8 Hz) in “The Transmission of Electrical Energy Without Wires As A Means Of Furthering World Peace”, Electrical World And Engineer, January 7, 1905, PP 21-24. 1. Ratzlaff, John, Tesla Said, Tesla Book Company, PO Box 1649, Greenville, TX 75401, 1984. 2. Yogananda, Paramahansa, Autobiography of a Yogi, Self Realization Fellowship,, 3880 San Rafael Ave., Los Angeles, CA 90065, 1985. 3. Cheney, Margaret, Man Out of Time, Prentice Hall, 1981. 4. Hunt, Inez and Draper. Wanetta, W., Lightning In His Hand, The Life Story Of Nikola Tesla, Omni Publications, Hawthorne, CA, 1981. 5. O’Neal, John, J., Prodigal Genius, The Life Of Nikola Tesla, Ives Washington, Inc., 1944. 6. Anderson, Leland, personal communication. See also Anderson, L.I., and Ratzlaff, J.T., Dr. Nikola Tesla Bibliography, Ragusan Press, 936 Industrial Avenue, Palo Alto, CA 94303, 1979. 7. Nikhilananda, Swami, Vivekananda, The Yogas and Other Works, Ramakrishna-Vivekananda Center, New York, 1973. 9. Dobson, John, personal communication. 7. Dobson, John, Advaita Vedanta and Modern Science, Vedanta Book Center, 5423 S. Hyde Park, Chicago, IL 60615, 1979. 13. From the personal collection of L. Anderson. 14. Russell, Lao. personal communication. 15. The University of Science and Philosophy, Swannanoa, Waynesboro, VA 22980, (703) 942-5161. 16. First written by Tesla on May 13, 1907, for the “Actors Fair Fund”, text transcribed from an A.L.S. in the collections of the Bakken Library of Electricity in Life. The article later appeared in the “New York American”, July 6, 1930, pg. 10. 17. Tesla, Nikola, The New Art of Projecting Concentrated Non-Dispersive Energy Through Natural Media, Proceedings of the Tesla Centennial Symposium, Grotz, T. & Rauscher, E., Editors, 1984. 18. Turchi, P.J.,Conte, D.,Seiler, S., Electrostatic Acceleration of Microprojectiles to Ultrahypervelocities, “Proceedings of the Seventh Pulsed Power Conference”, June 12th-14th, Monterey, California, Jointly Sponsored by the DOD, DOE, and the IEEE Electron Devices Society. 19. “Death Ray for Planes”, New York Times, September 20, 1940. 22. El-Kareh, E., Elswick, S., memo, 1987. 24. Cheney, Margaret, Tesla, Man Out of Time, Prentice Hall Inc, Englewood Cliffs, NJ, 1981. 25. Gordan, Bruce, private communication, 1988. 26. Arguelles, Jose & Lloydine, personal communication. 27. Hercules, Michael, The Circle of Love, published by the author. 28. Castenada, Carlos, The Power of Silence, Further Lessons of don Jaun, Simon and Schuster, New York, 1987, Pg. 120. Mr. Toby Grotz, President, Wireless Engineering, is an electrical engineer and has 16 years experience in the field of geophysics, aerospace and industrial research and design. While working for the Geophysical Services Division of Texas Instruments and at the University of Texas at Dallas, Mr. Grotz was introduced to and worked with the geophysical concepts which are of importance to the wireless transmission of power. As a Senior Engineer at Martin Marietta, Mr. Grotz designed and supervised the construction of industrial process control systems and designed and built devices and equipment for use in research and development and for testing space flight hardware. Mr. Grotz also worked for the public utility industry installing mini computer based pollutant measuring data acquisition systems in fossil fuel power plants and as a results engineer in a nuclear power plant. Mr. Grotz organized and chaired the 1984 Tesla Centennial Symposium and the 1986 International Tesla Symposium and was president of the International Tesla Society, a not for profit corporation formed as a result the first symposium. As Project Manager for Project Tesla, Mr. Grotz aided in the design and construction of a recreation of the equipment Nikola Tesla used for wireless transmission of power experiments in 1899 in Colorado Springs. Mr. Grotz received his B.S.E.E. from the University of Connecticut in 1973. Copyright � by ThothWeb – Your Portal to the Unknown .